Tools: Wire stripper, Hex Wrench No.2, Solid Wrench No30 or Monkey Wrench wide than 3cm. e. Installation of cable end male connector is the same as female connector. f. Mating male and female connector : Push the plug into the socket completely, then rotate the locker according to the direction instructed by the marks on the locker. 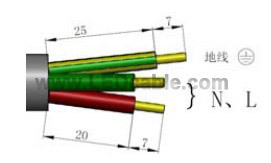 a. Crimp wires, screw twisting torque 0.8+/-0.1N•m. b. Slide flat gasket onto Panel Body. c. Insert Socket Body into the hole in the panel, and then tighten the Hex Nut , torque 4+/-0.5N•m. d. Mating plug and socket: Push the locker onto the socket housing completely, then rotate the locker according to the direction instructed by the marks on the locker. a. Separate the male and female connector, rotate the locker according to the direction instructed by the marks on the locker.